TAUNTON, Mass. – In the quarterfinal round against Wellesley, Mansfield (20-6) went on a quick four-point run at the end of the first half that cut the deficit to single digits and gave the Hornets, who have been a standout second half team all season, a little extra confidence heading into halftime. On Thursday evening at Taunton High, the Hornets got off to a tough start to their Div. 1 South semifinal against Braintree. Plagued by turnovers and struggling to knock down shots in the first half, Mansfield was still able to cut the Wamps lead to 10 points and head coach Mike Redding implored the Hornets to win the final three minutes of the half. Instead, it was the Wamps that went on a run that essentially won the game. Braintree went on a 12-1 run in the final three minutes of the second quarter to push the lead to 21 and kept the pressure on throughout the second half, pulling out a 68-40 victory that advanced the Wamps to their seventh straight South final. In last year’s South final, Braintree caught fire and rained down threes to beat Mansfield, but on Thursday the Wamps were struggling from the floor in the opening quarter. 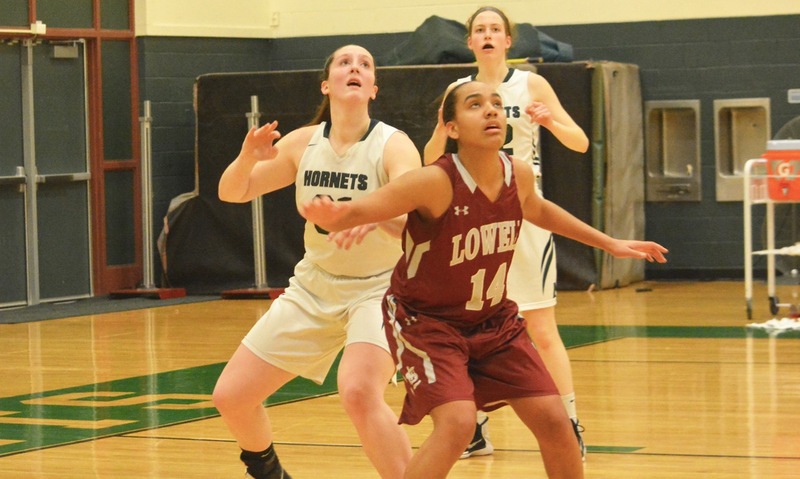 Braintree was able to build a lead thanks to its defense, which forced a number of turnovers in the opening half and put pressure on the Hornets ball-handlers to deny the entry pass into Meg Hill in the post. After Hill scored from a lobbed Ann Maher pass to make it 4-2, Braintree went on a 7-0 run before Hill scored again, this time on Steph Kemp assist. Jeniyah Jones beat the Hornets defense on the baseline and the Wamps led 13-6 after one. In the second, Hill (19 points and five blocks) continued to be the lone Hornet to find any success on the offensive end. She scored four of the team’s seven points and had all four of Mansfield’s made field goals in the opening half. Mackenzie Moore scored five points for the Wamps and Jones continued to fill up the scoresheet with eight of her team-high 15 points, including the final six points of the half. She also finished with 10 steals, eight rebounds and five assists. Braintree turned a 22-12 lead into 34-13 by the end of the half and completely took control of the game. It may have been a little too late to save the semifinal, the Hornets did find their offense in the second half. Hill completed a three-point play, Kemp knocked down a jumper off a Sydney Mulkern assist, Maher grabbed an offensive rebound and hit a jumper for her only two points of the game, and Emily Vigeant chipped in with all six of her point in the third. Mansfield scored 15 points in the third quarter, two more than it scored in the entire first half, but the Wamps were able to score 19 and continued building the lead. Timberlake (14 points) drilled a three, Jones added three points and assisted on back-to-back baskets for Alyssa Tenaglia. Braintree led 53-28 after three. Maggie Danehy, who was coming off a career-high 20-point game against Wellesley, scored four of her five points in the fourth, but Hill was the focal point for the Hornets down the stretch, scoring eight points to close out her standout career, which Redding said was definitely worthy of the school’s Hall of Fame. During her four varsity seasons, Hill went to four Div. 1 South semifinals and won three straight league titles, while playing in a remarkable 100 games for the Hornets. The Hornets have been one of the most consistent programs in Div. 1 in recent years, but talented Braintree teams have always stood in the way. Redding is expecting that Mansfield will be right back in the mix again next winter. TAUNTON, Mass. 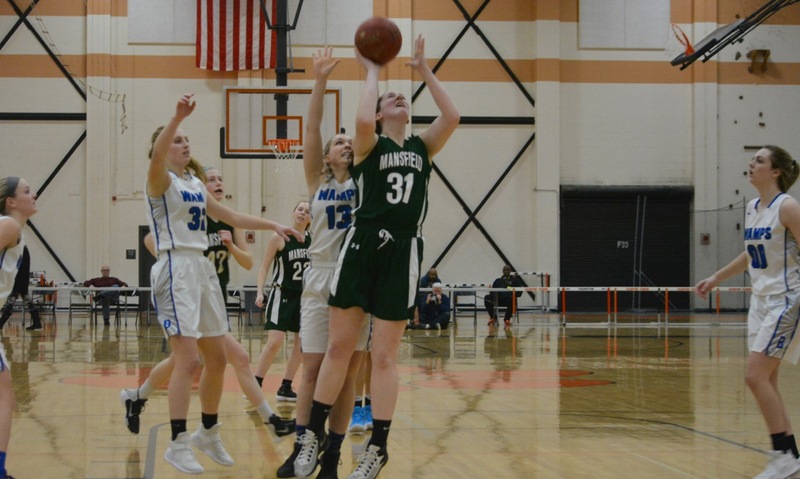 – Mansfield scored the final four points of the first half to cut the Wellesley lead to single digits going into the break in Saturday afternoon’s Div. 1 South quarterfinal at Taunton High. At the time it didn’t feel like much of a turnaround, but for a team that has been dominating in the second half all season it was just the spark that was needed to get going. The Hornets turned that small four-point swing into a 13-0 run to get its first lead since the game’s opening basket, allowed only three points in the third quarter and only gave up 11 in the second half. In the end, it turned out to be a 35-11 run to close out the game and give Mansfield a 48-35 victory that books a return to the semifinal. One of the keys to the comeback was a change from a 1-3-1 zone into a more traditional 2-3 look that allowed the Hornets to get out to the Raiders’ shooters. In the early going, Mansfield was scrambling and Wellesley took advantage. Emma Dougherty, Brooke Guiffre and Sofie Paulsen each knocked down threes in the opening quarter, as Wellesley opened up a 17-7 lead, which was aided by Meg Hill picking up two fouls inside the opening four minutes of the game. Paulsen (15 points) also got free for seven points in the second, including a three that put Wellesley ahead 24-13. The comeback started innocuously enough, as Hill came back into the game and scored off an assist by Ann Maher and then she got a layup off a drive and dish by Sydney Mulkern. The four points cut the lead to seven going into the break and Redding was pleased with the way the team weathered the storm while Hill was in foul trouble. Mulkern assisted on another Hill bucket coming out of halftime and then Maggie Danehy knocked down a jumper to cut the lead to three. Junior point guard Mady Bendanillo then went on a personal 5-0 run that put Mansfield ahead for the first time since it was 2-0. She got a steal and layup plus the foul to tie the game and then grabbed a defensive rebound and beat everyone down the floor for the layup and the lead. The lead didn’t last long, as Gianna Palli stepped way beyond the arc to hit a three to make it 27-26, but that would be the only basket that the Hornets allowed in the third. Danehy scored on a put-back and then Maher (seven points) made her only three of the game to put the Hornets up by four heading to the fourth. Mansfield kept the pressure on in the fourth thanks to Danehy, who scored six of the first nine points in the quarter, including a free throw line jumper off a Maher assist that made it 37-30. She finished with a game-high 20 points and pulled down six rebounds. Wellesley only managed eight points in the fourth, including a pair of threes, and was never able to get any closer than five points. Maher got free with a cut down the lane off an inbounds pass from Emily Vigeant, who had three assists in the fourth. Hill scored a layup off a Vigeant pass and Bendanillo (10 points and four assists) scored with a drive down the lane. Hill (10 points and 12 boards) capped the win with a layup in traffic off a Danehy assist. Mansfield (20-5) will face another familiar Bay State Conference opponent in the semifinal, as the Hornets will get a rematch with No. 2 seed Braintree, which beat Mansfield in last year’s sectional final. #1 Franklin, 79 vs. #8 Lincoln-Sudbury, 49 – Final – Click here for a recap from this game. #5 Milford, 67 @ #4 Medfield, 60 – Final – Milford jumped out to a 9-0 lead, led 18-10 after the first quarter, took a 37-28 lead into the halftime break and never surrendered its advantage. Medfield used a 9-5 run to close the gap to single digits in the fourth quarter but Milford closed the door to earn the win. Senior Andrew Fraioli paced the visitors with 19 points and 15 rebounds, junior Brendan White added 19 points and 10 rebounds and senior Shane Cosquete chipped in with 11 points. #4 Foxboro, 60 vs. #13 New Mission, 43 – Final – Click here for a recap from this game. #3 Mansfield, 38 vs. #14 Newton North, 28 – Final – It wasn’t the prettiest game, but the Hornets held off a Newton North comeback in the second half to advance to the Div. 1 quarterfinal. 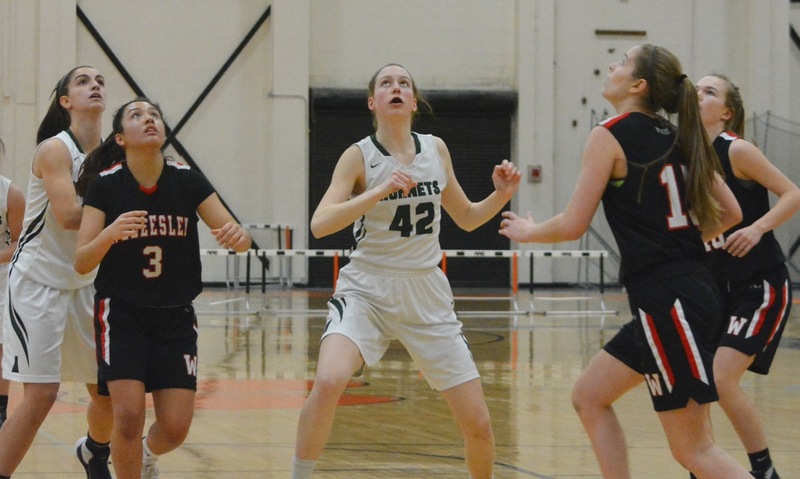 Meg Hill scored 11 points and pulled down 16 rebounds in the win and Maggie Danehy added 11 points and eight boards for Mansfield, which will host sixth seed Wellesley on Saturday afternoon. #5 Oliver Ames, 69 vs. #12 New Bedford, 39 – Final – Click here for a recap from this game. MANSFIELD, Mass. – All season long, Mansfield has found a way to turn games around in the second half by locking down on the defensive end of the floor and getting good looks on offense. The Hornets needed those in-game adjustments again on Wednesday night in the final of the Roundball Classic at the James Albertini Gym. Mansfield went on an 18-4 run between the third and fourth quarters to turn around a nine-point deficit against Lowell and then held off the Red Raiders in the closing seconds for a 50-48 victory in the regular season finale. At the start of the game, Mansfield went with a box-and-one, using Sydney Mulkern and Emily Vigeant (with the other four defenders always looking to help) to face-guard Lowell senior Shyan Mwai. It worked to stop Mwai, who hit a step-back three but was held to four made field goals and 12 points in the game. The problem was that her classmate Brittany Mota was finding spaces in the zone and knocking down shots. She scored five in the first to help Lowell build a 12-9 lead after one quarter. She caught fire in the second, getting open looks from both corners and knocking down three from beyond the arc and scoring 11 of her game-high 22. On offense, Hornets were getting decent looks but were unable to knock down shots consistently. Meg Hill (19 points and 14 rebounds) hit a jumper that cut the Lowell lead to 22-20 but the Red Raiders finished the half on a 7-0 run. Redding was frustrated during the second quarter, at one point yelling for his team to ‘wake up.’ Apparently the halftime conversation did just that because Mansfield came out of the break looking like a different team, in part because of a defensive switch. “Mato killed us in the first half, so we went from a box-and-one to a triangle-and-two and that seemed to slow them down a little offensively and our other three kids were able to keep the other three off the boards,” Redding explained. Ann Maher was switched onto Mato, holding her scoreless for the first 15 minutes of the second half. Still, when Mwai went down the lane and scored plus the foul, the Hornets found themselves trailing 38-31, but the Red Raiders would not make another shot from the floor until the final minute of the game. Vigeant hustled to score on an offensive rebound and Kara Bendanillo knocked down a pull-up jumper to close the gap to three points heading into the fourth. Hill and Maggie Danehy (14 points and 11 rebounds) each scored four in the third, as the Hornets started to get the ball inside. That was the game plan for the fourth, as Hill got the ball under the basket on numerous occasions. Vigeant got a steal and fed Hill for a layup and she scored off a lobbed assist by Mulkern that put the Hornets ahead 41-40, their first lead since it was 13-12. Danehy, who was named the tournament’s MVP, assisted on a layup for Mulkern and then chased down an offensive rebound and scored to build the lead. After a pair of Lowell free throws, Hill scored again in the paint, this time from a Maher assist, and then Maher (nine points) added a pair at the line to seemingly ice the game at 49-42. Mato had other ideas. She buried a three to cut the lead to four and then added a second three with 3.4 seconds remaining that got the visitors back within one. Maher made 1-of-2 at the line but Lowell could not collect the rebound and the game ended with a narrow Mansfield win. “This was a really good test against a quick defensive team that had a couple really good offensive players and our division is really good but there’s not a lot of size…so they’re kind of the same style as Wellesley and Braintree,” said Redding as he looked ahead to the state tournament. Mansfield finishes the regular season at 18-5 (16-3 in terms of seeding for the tournament). FRANKLIN, Mass. – Mansfield had a lot on the line when it traveled to its biggest rival on Friday night. 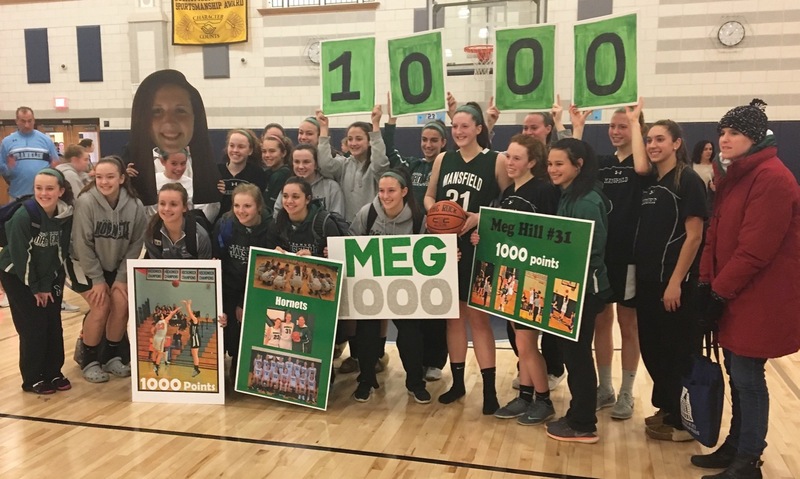 A win against Franklin would clinch at least a share of a third straight league title for the Hornets, while senior center Meg Hill was only seven points away from reaching 1,000 for her career. With a layup off a feed from Mady Bendanillo late in the first quarter, Hill (17 points, nine rebounds) made quick work of her accomplishment, but the Hornets needed to battle to the end to pull out a 62-48 victory that sealed a three-peat of Kelley-Rex titles. Hill got on the board off the opening tip, as Franklin allowed the Hornets to take a quick lead in order to get points for senior forward Kate Morse, who is out for the season with an injury. Ann Maher got off to a red-hot start from the outside to help Mansfield stretch the floor and open up an early lead. She hit the first of three from beyond the arc in the quarter off a Hill feed and then Hill knocked down a jumper for a 7-2 advantage. After the Panthers tied it up, another Maher three was followed by another jumper by Hill. Ali Brigham (11 rebounds) hit a jumper, the first two of her team-high 16 points, but Maher again was able to answer with another shot from long distance. Sitting just one-point from 1,000, Hill reached the milestone with a transition basket, off a feed from Bendanillo (eight assists). After a timeout to celebrate Hill’s career mark, Bendanillo closed out the first with a three for a 20-9 lead. The Hornets finished with nine threes as a team. “We knew Maher was a good shooter and you try to rotate the defense to her and Meg and other set some good screens and she knocked down some quick ones but I thought it was the supporting cast that really shot well for them and really made the difference tonight,” said Franklin coach John Leighton. Franklin did not back down and rallied in the second quarter. 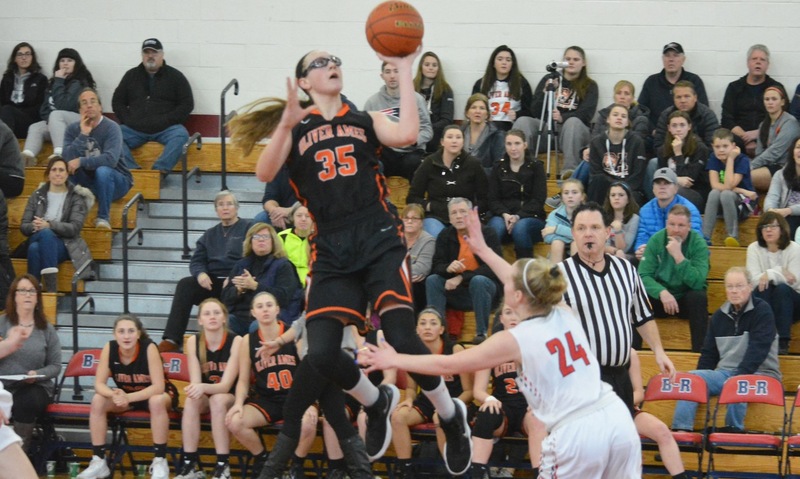 Mansfield tried to switch up defenses to limit Brigham and Bea Bondhus, but Breanna Atwood (10 points) banked in a three-pointer and got behind the defense for a layup off a feed by Megan O’Connell. O’Connell also scored six in the second, finding space at the high post. Bendanillo (eight points) drilled a second three and Hill scored on an offensive rebound, but O’Connell’s drive in the final minute cut the lead to just 29-26 at halftime. The Hornets broke the game open in the third quarter. Maher (15 points) hit the fourth of her five three-pointer on the night to get it started and Hill hit another jumper. Sydney Mulkern (nine points) scored five points in quick succession and suddenly it was a 13-point edge. Bondhus (10 points) hit a three to get back within 10 but Mansfield showed its depth with Steph Kemp hitting a jumper, Emily Vigeant driving to the basket for two, and Erin Daniel draining a three to push the lead to 48-35 heading to the fourth. Both teams found scoring a struggle at the start of the fourth and Franklin was able to chip away at the lead, getting it as close as 56-48 after Bondhus finished in traffic, but the Hornets went 6-for-6 from the line to close it out. Wins at Franklin are always welcome for the Hornets. Four years ago a loss at Franklin cost Mansfield a share of the league title and the Panthers handed the Hornets their only league loss on the same court last season. So, Redding was pleased to walk away with the victory on Friday. Mansfield (15-4, 13-1) can clinch the outright league title on Tuesday at King Philip. Franklin (11-7, 9-5) will try to bounce back when it travels to Attleboro.